What we learned from an ugly home loss. That was one ugly game of basketball. 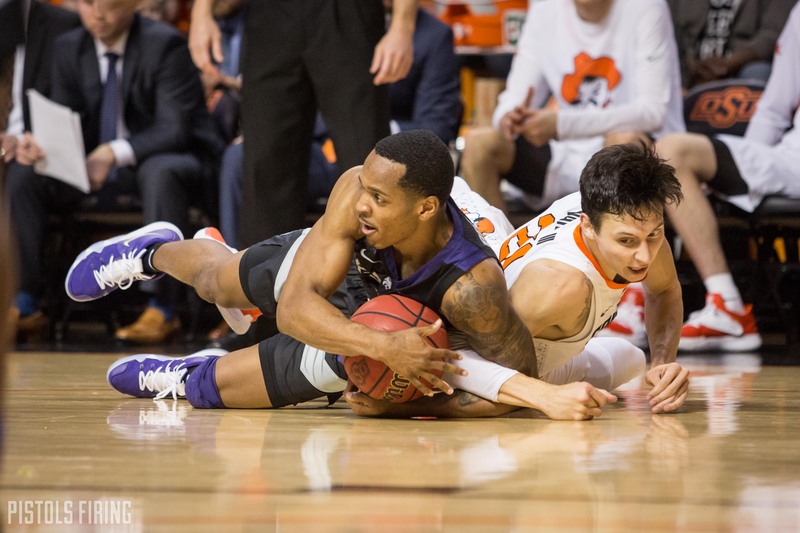 Oklahoma State fell to Kansas State 75-57 in Gallagher-Iba Arena on Saturday evening. The Cowboys (9-12 overall, 2-6 Big 12) trailed by as many as 34. With West Virginia beating Oklahoma earlier Saturday, the Cowboys took a step closer to the bottom of the Big 12. Here are five thoughts from a game that was tough to watch. There have been nights this year where the Cowboys offense has been off and a few nights where their defense has been. Saturday, both were off. Entering Saturday, Kansas State gave up an average of 58.8 points a game, which is the fourth-best in the country, so OSU’s 57 points fell in line with that. With that said, K-State averaged 64.6 points a game, which ranks 330th in the country, and the 75 the Wildcats hung on OSU was the most since Kansas State scored 77 on Lehigh on Nov. 24. The Wildcats shot 55.2 percent from 3-point range, the team’s highest 3-point percentage of the season. The game all flows together. The Wildcats were able to push the ball up the floor off OSU misses and not allow the Cowboys to get set, leading to higher percentage looks. K-State went on a 19-0 run that started at the end of the first half and bled into the second. Without going through and looking, I’d imagine that’s the biggest run the Cowboys have allowed this season. K-State big man Dean Wade dropped a season-high 24 points one the Cowboys off 9-for-9 shooting. Wade, at 6-foot-10, scored three 3s and was a game-high plus-31 in only 29 minutes. Wade missed six games earlier in the year with injury, but the Wildcats have yet to lose a Big 12 game that he has played this season. When Wade was done scoring Saturday night, he had 24 points when OSU had 32, making the game between Wade and the Cowboys closer than the game between the Wildcats and the Cowboys. The one national thing the Cowboys had to hang their collective 10-gallon hat on was Lindy Waters’ NCAA-leading free-throw percentage, but K-State took that, too. Entering Saturday, Waters made 96.4 percent of his foul shots, which was tops in the country, but Saturday, he missed his only attempt, which bumps him to 94.6 percent. That will put him at least behind Wright State’s Cole Gentry at the end of the weekend. Waters is now 53-for-56 from the stripe this year. When it rains it pours, I guess. The Pokes ended the game on a 19-3 run off a barrage of 3-pointers from Curtis Jones, Thomas Dziagwa and Luke Major, so that’s something to build off. The run stopped the game from being the worst home loss in GIA history, and it kept the game from being the largest loss of the Mike Boynton era. Jones scored 8 points in the final three minutes and finished with a team-high 14 points. It was fairly obvious when OSU hadn’t scored in the first six minutes of the second half or when the Cowboys trailed by 34 that OSU wasn’t going to win, but the Cowboys kept chucking up 3s like they had a chance. Major, a walk-on, hit his second career 3 with 1:17 left, which pushed him past 10 points this season. I would’ve taken the under on that had you asked me during the Cowboys summer practices. Freshmen Center Yor Anei had one block Saturday, moving him to 42 blocks this season. That draws him even with Byron Houston’s junior season and Leroy Combs’ junior season for 22nd on OSU’s all-time list. Anei has blocked an average of two shots a game through his first 21 collegiate games. That puts him #OnPaceGuy to finish the regular season with 62 blocks, three behind Houston’s freshman record. It would also be the eighth most in a season in school history. Anei’s performance Saturday was relatively good. Along with the block, he scored 9 points, brought in five boards and was a minus-7, the highest of OSU players who played at least five minutes.